BP is right on the heels of Shell Oil in the race for oil in the Fragile Arctic region. 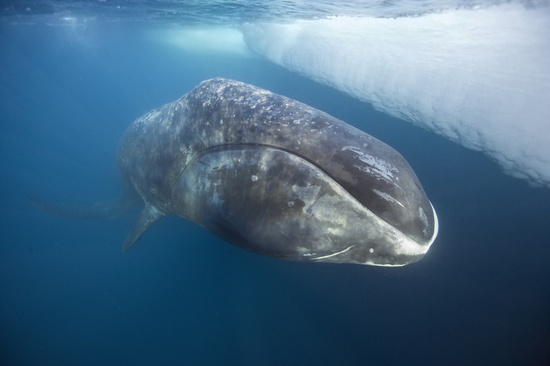 Shell has been given permits to begin seismic testing and exploration drilling in the Chukchi Sea and the Beaufort Sea both to begin on July 1,2012, through October 31, 2012. 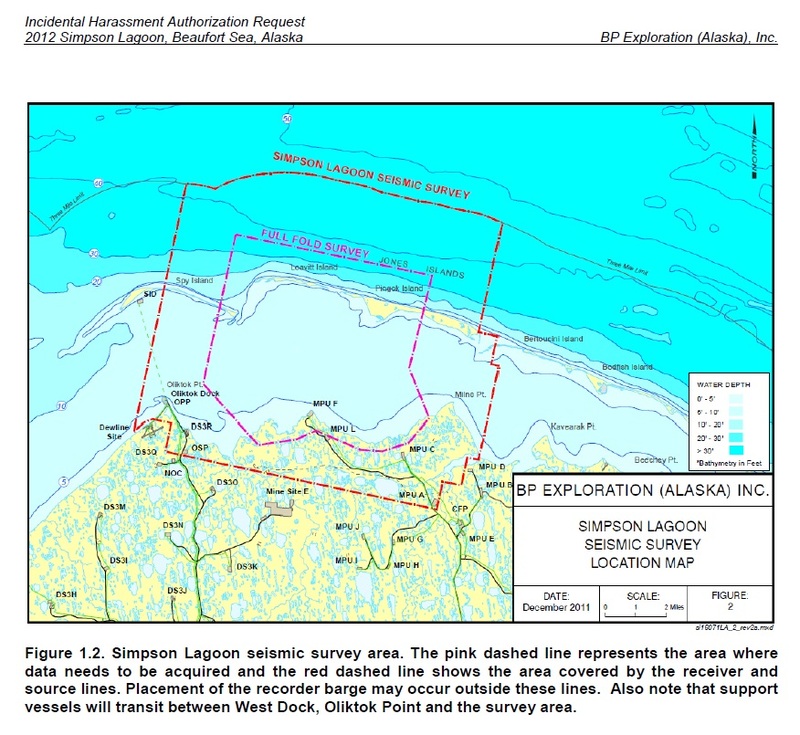 British Petroleum (BP) is also requesting a permit to begin a seismic survey in the fragile Simpson Lagoon in the Beaufort Sea a small and pristine habitat teeming with life. BP is known for their environmental disaster in the Gulf Coast that is still suffering from the spill, “Dolphins and fish are dying at distressing rates as oil and dispersants from BP’s 2010 spill lurk in Gulf waters and south Louisiana marshes”source. If BP is awarded this permit both Shell Oil and BP will be doing seismic surveys during the same period in the Beaufort Sea for and estimated 50 days. Two of BP’s ships will be firing air guns 24 hours 24 a day at dB levels of >160dB sometimes creating blasts as high as 230dB flooding the shallow Simpson Lagoon and Barrier Islands with sound for several months Source. 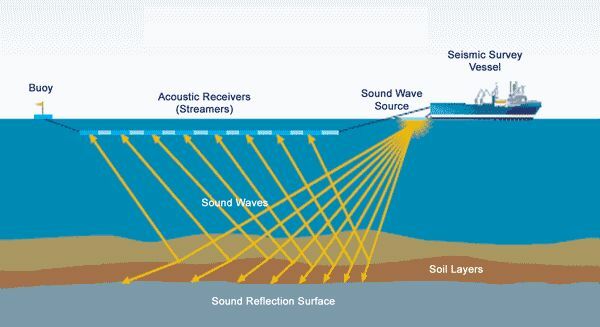 What is a seismic survey? “Seismic surveys are used to locate and estimate the size of offshore oil and gas reserves. To carry out such surveys, ships tow multiple air gun arrays that emit thousands of high-decibel explosive impulses to map the sea floor. The auditory assault from seismic surveys has been found to damage or kill fish eggs and larvae and to impair the hearing and health of fish and marine mammals, making them vulnerable to predators and leaving them unable to locate prey or mates or communicate with each other. These disturbances can disrupt and displace important migratory patterns, pushing marine life away from suitable habitats like nurseries and foraging, mating, spawning, and migratory corridors. 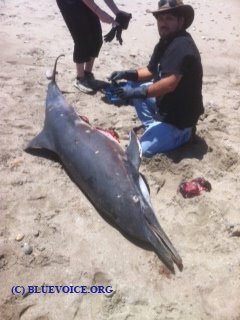 In addition, seismic surveys have been implicated in whale beaching and stranding incidents” source. “The source level of most air gun arrays can be 200dB or higher. For comparison, a loud rock concert is about 115dB and a jet engine at 100 feet is about 140dB. A typical seismic air gun array pulled by a ship might fire its compressed air bubbles into the ocean five or six times a minute — more than 7,000 shots in 24 hours”source. To see an air-gun underwater explosion click on this link . Imagine the damage the air guns will do to a shallow fragile, coastal environment of the Simpson Lagoon, “The survey area in Simpson Lagoon has water depths of 0 to 9 ft between the shore and barrier islands and 3 to 45 ft depths north of the barrier islands”source. BP plans to use three seismic ships that will carry a total of 40 air guns some of which will fire simultaneously for 24 hours a day. “Again, the advantage of source vessels alternating shots is that more data can be acquired in shorter time. Seismic data acquisition is a 24 hour per day operation”source. 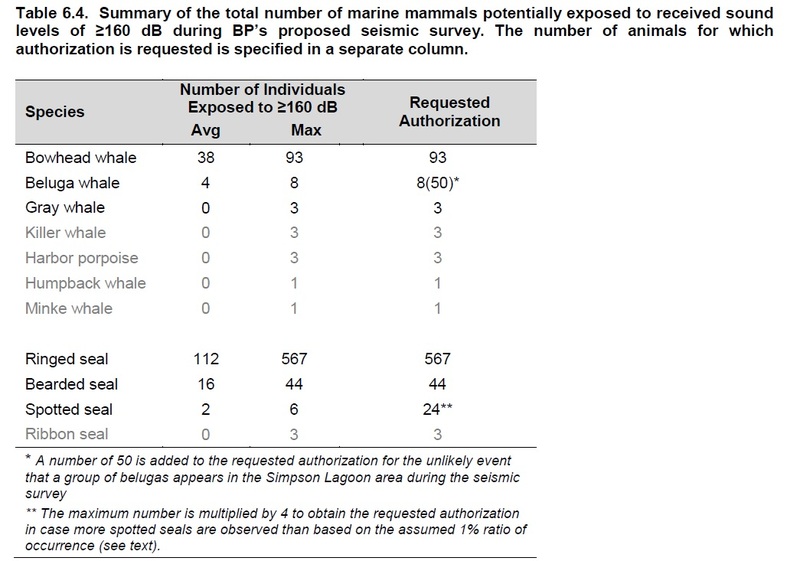 How many cetaceans and pinniped is BP asking to expose to greater than 160dB of sound? These number are for the Simpson Lagoon area not including the barrier islands. To see incidental take number for barrier islands follow this link. In addition, what will happen to the algae, phytoplankton, krill, fish, squid and other diverse marine life of this Arctic region? Home to Bow head, Beluga and gray whales this is an area so sensitive that no commercial fishing has been allowed under National Marine Fisheries Ruling established in 2009 source. When so little is known about the sea life and eco-system in this remote part of the world is it really prudent to open it up to oil and gas exploration? There are few protections for even dolphins and whales protected marine mammals. Marine Mammals Observers (MMO) are stationed two to a ship watching for whales. This crude form of monitoring does not take into account underwater activities of cetaceans and other sea life. There is little known about Simpson Lagoon and Barrier Islands, “Information on fishes in coastal waters of the Alaskan Arctic is outdated or nonexistent” source. Is the risk of an oil spill worth it? Isn’t the death of just one whale from air guns or an oil spill too much? Isn’t the death and destruction of the algae, and other nutrients and low level life on the ocean floor too much? 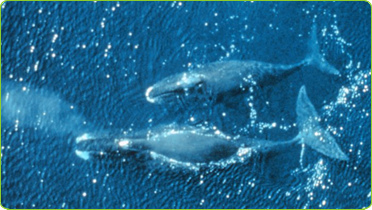 Isn’t allowing BP to do seismic testing or any kind of oil exploration in the Arctic Beaufort Sea asking too much? What can you do? 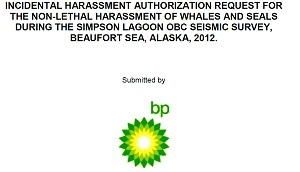 Send NOAA/NMFS an email asking not to award BP the permit for a seismic survey in the Beaufort Ocean. Comments and information must be received no later than May 31, 2012. Comments should be addressed to: Tammy Adams, Acting Chief, Permits and Conservation Division, Office of Protected Resources, National MarineFisheries Service ITP.guan@noaa.gov or 1315 East-WestHighway, Silver Spring, MD 20910. The mailbox address for providing email comments is source.